In the midst of the wild success that the Houston Astros have experienced this season, the success of Alex Bregman has sort of fallen by the wayside. The bulk of that lack of attention is probably due to the slow start that he experienced to kick off the 2017 campaign, followed by an extremely lackluster month of June. But as the month of July nears its end, Bregman has experienced a rise in productivity and has emerged as an essential contributor as the likely favorites for the American League pennant. Bregman’s overall numbers on the season aren’t exactly among the league’s elite third sackers. He ranks 17th out of 25 qualifying players at the position in WAR (1.5) and 13th among the same group in Off rating (5.1). But it’s certainly hard to frown on an output that features an on-base percentage of .350, a walk rate over 10%, and a wRC+ that paints him as a relatively well-above average offensive performer, with a 115 mark. At the same time, while his numbers wouldn’t be deemed poor in really any regard, there isn’t a whole of of spectacular to go around in his overall production for the year. His slash features that .350 OBP, as well as a .267 batting average and .795 OPS. His ISO for the year comes in at .178, about 35 points lower than he turned in across 217 plate appearances in 2016. In relation to the average, the luck hasn’t quite been there, with a BABIP of only .298 for the year, but the fact that Bregman has been overlooked has more to do with the fact that the third base position is absolutely loaded with elite talent more than any shortcomings of his own. Despite being overshadowed, Bregman has spent the last month excelling almost more so than almost all of his counterparts at the position. With the calendar about set to close for July, Bregman has been on a hot streak that has really driven up production and has those overall statistics looking quite a bit more favorable than they would’ve been otherwise. This month was especially essential for him coming off of a month of June where he hit just .215 with a wRC+ of 93. In rebounding from that brutal month, Bregman has spent the last month tearing the cover off the ball. His Off rating (6.8) trails only Anthony Rendon and Travis Shaw over the last 30 days. His .329 average and .420 OBP over that span both rank fifth among the 30 players that qualified during that time. He struck out at a rate of only 13.6%, 21st lowest, while ranking at the 12th highest rate, at 12.5%. He’s upped the ISO, at .237 over the 30-day period, while making hard contact 34.4% of the time, which has certainly aided him in posting a BABIP over .370. Despite being in such dire need of a rebound after that month of June, a lot of what Bregman’s done this year has been right in line with what was expected from him. He’s making contact at a rate of 84.7%, while whiffing only 6.6% of the time. Those each fall right in line with his production from the last 30 days, as he posted a Contact% of 84.8% and a whiff rate of 6.1%. Those both represent vast improvements from his time in the big leagues last year, and are each far more indicative of the skill set that he possesses, as a guy with high contact ability and high upside in the power game. He’s maintained a quality approach, with a 43.4% swing rate and 3.76 pitches per plate appearances. That’s a lot to like, even if he hasn’t quite broken out at the level that was expected. Any disappointment really stems from a lack of productivity in the power game. Not that Bregman was expected to be some big behemoth in that respect, but something more around or above the .200 mark in the ISO department was probably to be expected. Instead, that figure has been relatively limited. Perhaps his recent stretch of offensive success will lead to a rise in that regard. Overall, it’s hard not to be excited about the recent turnaround that Alex Bregman has showcased. His quality approach and high contact ability have proven to pay off in the past month more than the others, and his cumulative numbers for the season are better for it. One hopes that his recent hamstring injury isn’t the type that lingers and affects production moving forward. But with that current skill set and still developing power, the last month has renewed excitement that might have waned early on in relation to Alex Bregma. A quick comparison between the tailspin of the Baltimore Orioles and the stat sheet of Manny Machado would seem to indicate that the third baseman is heavily responsible for the woes of the O’s over these last few months. However, the story of Machado’s 2017 isnt necessarily one of immense struggles, as his numbers might indicate, but rather one that remains something of an enigma. Despite numbers that pale in comparison to what he’s posted in two consecutive seasons of 6+ WAR, Machado hasn’t been nearly as bad as those figures might indicate. His park-adjusted offense alone seems to indicate that he’s been a touch below average compared to his big league counterparts. It’s his defense almost exclusively that has him in the top ten among third basemen in WAR, given that his Off rating is just 0.2 to this point in the season, which ranks 17th out of 24 qualifying players at the position. That isolated power figure also represents a relatively significant disappointment, with Machado coming off of a year in which his power potential finally manifested itself in something statistically significant. Obviously there’s the slight dip in his contact rate, with his whiff rate also slightly rising from 10.0 to 10.9%, but there isn’t anything outlandish that should indicate why Machado has experienced such a significant decline in overall production from one season to the next. Except that BABIP. In fact, Machado’s .253 average on balls put in play is the 13th lowest among 168 qualifying position players in Major League Baseball. With his soft and hard contact rates each trending in the ideal direction, it’s extremely difficult to account for the cause of such a startling fall in the BABIP game. One potential explanation of where that drop comes from is where Machado has been swinging within the zone. Even if his overall swing rates and whiff rates have remained relatively constant, he has demonstrated something of a penchant for swinging at pitches on the outer part of the strike zone, something that wasn’t quite as prevalent in 2016. This is significant because Machado has put the ball on the ground far more this year than he did in 2016, with a 43.2 GB% against a 37.6 mark from last year. It likely cannot be attributed as entire source of his woes, but such a rise in groundballs, in conjunction with a pull percentage that is actually higher (44.0% 41.9%) likely serves as some foray into the woes that Machado has experienced, at least to an extent. Trying to swing at those outside pitches and maintaining such a high pull rate is likely leading to some semblance of rolling over, hence the increase in groundballs. The good news is that there are two encouraging things related to Machado’s output. For one, if this is, in fact, the source of at least some of his statistical shortcomings this year, it would appear to be an easy fix. Approach and zone awareness are far less concerning than if Machado were experiencing some sort of mechanical flaw that developed over the offseason. 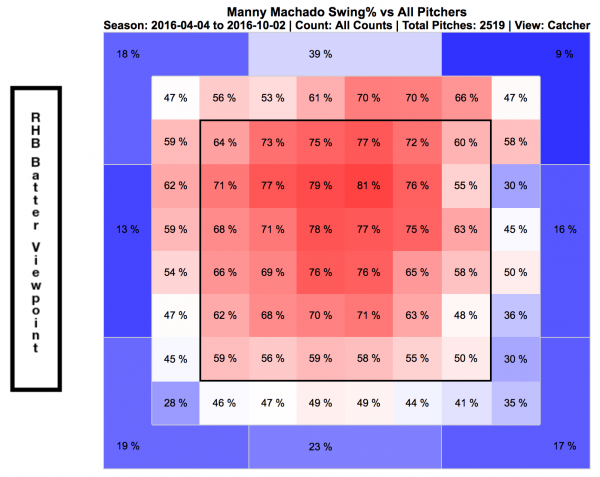 So perhaps we see an adjustment from Machado moving forward to get that GB rate back down and get back to the linedrive ways that he demonstrated last year. Additionally, Machado has been far better in the month of July than he had been in the previous months. After months in which he hit .224, .191, and .242, Machado is off to a .351 start in July, through 62 plate appearances in the month. He’s putting the ball on the ground just a touch less, at a rate of about 40%. Perhaps more importantly, though, his BABIP for the month is sitting at .378. 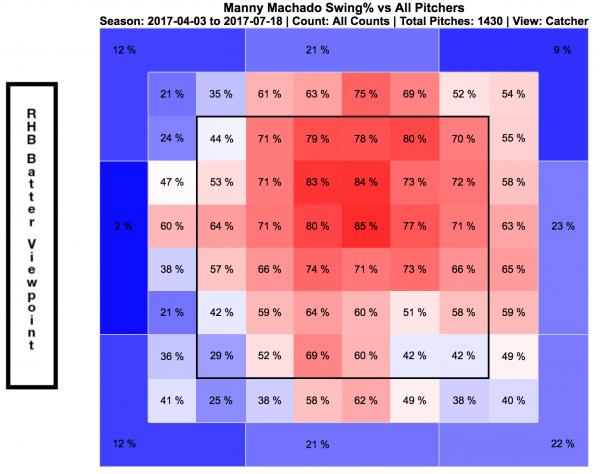 And that’s more reflective of the type of output we should expect from Manny Machado moving forward. While he’s never been an extremely high BABIP guy, he isn’t doing anything that should indicate his BABIP, or overall production, should be as low as it is. Things tend to even out over time, and assuming Machado continues to make the type of contact that he is and perhaps get the ball on a line with any more regularity, there doesn’t appear to be any reason to be legitimately concerned about Machado moving forward in 2017. There aren’t many players who have had as interesting, or perhaps as volatile, a career arc as Mike Moustakas has. His last few seasons have featured him being demoted to the minor leagues, finally experiencing a breakout, tearing his ACL, and, most recently, the fact that he’s set to be featured in this year’s Home Run Derby. Having already set a new career high in home runs, and currently posting the highest isolated power of his career, it probably isn’t a surprise that we’ll see him participate in the event in Miami. Even less surprising, though, may be the influx in power that we’ve seen from Moustakas. A player who gradually improved his ability to make contact, with rising Contact% figures that peaked across his 113 plate appearances in 2016, at 86.2, while also focusing more on taking the ball to the opposite field (30.8 Oppo% last year), resulted in him reestablishing value after it looked like he was a lost cause at the hot corner in Kansas City. This year, we’re continuing to see Mike Moustakas evolve, but in a completely different way. Is It Time To Trust Travis Shaw? There are a number of factors that have contributed to the surprising success of the Milwaukee Brewers thus far in 2017, with many of them found on the offensive side of things. Of those elements that have been essential to their rise in the National League Central, Travis Shaw has been a consistent source of offense, as well as quietly representing one of the more impactful offseason acquisitions of this past winter. After a season in which Shaw experienced a major regression after a hot start with the Boston Red Sox, he’s flourishing in a full-time role in Milwaukee. Does that mean it’s finally time to trust Travis Shaw? Coming into the 2017 campaign, Ryon Healy was a popular topic of conversation on an Oakland Athletics squad that ultimately doesn’t have a lot to be said for it. A sleeper candidate before the year began, some of the shine has since fallen off of Healy thanks to a slow start. Ranking 19th out of 24 qualifying third basemen in WAR probably doesn’t help his case, either. Having shaken off that rough start, however, and taking his questionable defense out of the equation, Healy is not only a player that stacks up well against his counterparts at the hot corner, but is meeting the expectations previously set forth for him. An offense-first, or perhaps an offense-only, type, Healy will continue to see time at third base, especially with the trade of Trevor Plouffe, while also filling in at first behind Yonder Alonso. And while he likely hasn’t done enough to establish himself as a fantasy starter outside of deeper leagues, he’s a versatile (in a fantasy sense) with a lot going for him at the plate. And by “a lot”, I mean a lot of power. I’ve always been a fan of Josh Harrison. It’s probably because I’m a fan of those superutility types, regardless of their actual ability to play all of the positions at which they appear. Nonetheless, there’s a certainly level of validation that comes along with actively cheering for Harrison this season. Despite the plight of the Pittsburgh Pirates, Harrison has been a steady performer to the point where WAR has him valued near the top of this year’s qualifying third basemen. It’s certainly worth exploring, though, if Harrison’s ascent in 2017 is legitimate, or if we should see him slip back down to the level of production that we’ve come to expect from him thanks to the past couple of seasons. 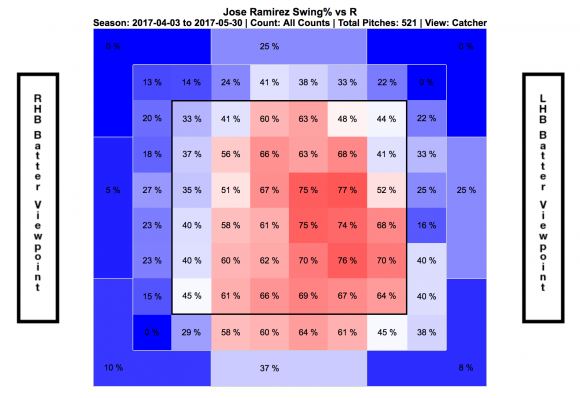 I’ve written about Jose Ramirez a couple of times since the tailend of last year, and there were a lot of notable things that I enjoyed about his game. There’s something fun about a high contact guy who runs the bases well, which is primarily what many, including myself, expected Ramirez to continue to be. With mixed results prior to 2016, many also wondered if we should expect legitimate production from the Cleveland third sacker heading into a new campaign. But not only has Jose Ramirez continued to perform at a high level, but as Eno Sarris noted at the beginning of May, he’s changed our perception of him as well, with his increased launch angle contributing in a variety of ways. That’s obviously an extraordinarily small picture of his 2016, but even so, there’s still a lot to like about that. Despite having one of the lowest walk rates among qualifying third basemen, he posted the highest contact rate among that same group. Even if the contact wasn’t particularly hard, his ability to run the bases (6.9 UBR led the position) helped to contribute to that .363 on-base clip, as well as the 22 swipes he posted. High-contact, high-OBP, and some speed on the bases. Even if he didn’t stack up against the elite at the hot corner, there’s still value in a skill set like that. When you factor in the versatility that he brought to the mix last year, something that isn’t quite as prevalent this season, you can understand why he was an intriguing option heading into the new season. He’s still reaching base a high rate, while maintaining a similar approach in terms of Swing%. The contact rate is still there and even if the strikeout rate is up a touch, the walk rate has come with it. One additional note is that his park-adjusted offense, by virtue of wRC+, has increased from 122 to 129. What’s particularly interesting there is that ISO. A 53 point rise in ISO is pretty significant, with Ramirez already four shy of the 11 homers he hit last year and one short of his triple total from 2016. This was an element that Eno focused on in the piece linked above, with launch angle playing a heavy role in the evolution of Jose Ramirez in 2017. Another thing that this graph contributes to is Ramirez’s decrease in Oppo%. His percentage of contact to the opposite field against right-handed pitching is just 20.0% this season, as opposed to the 30.4% mark that he posted last year. Interestingly enough, his Oppo% against left-handed pitching has actually increased about three percent, currently sitting at 26.3%. Is it possible that Ramirez is a different hitter depending on the batter’s box in which he stands? Not necessarily. The power is coming from the left-handed box. That’s the largest difference. But he’s still making really strong contact that shows improvement from last year, with his Hard% against left-handed pitching showing an increase of almost 10%. The evolution of Ramirez from 2016 to 2017 is really one that has taken place across the board, regardless of his handedness in a particular plate appearance. Ramirez has remained the steady on-base presence that he was last year. He’s still swinging at a decent rate while making high contact. What he’s doing differently this year is making harder contact and generating far more balls in the air. With that combination, he’s finding his way into the ISO column more often. He’s gone from a high-contact, speed type to a high-contact, speed type with legitimate power at the plate. Given that this is a change that has only been in development for really the first two months of the season, though, it’ll be interesting to see how it continues to evolve as the season wears on. Expect us to revisit Ramirez, his power, and his splits before the season comes to a close. In the unlikely event that you follow me on Twitter dot com, you’re well aware of my…we’ll call it infatuation with Jake Lamb and his penchant for murdering baseballs. I’ve made no secret of it on here as well, which is why I went back and saw just how many times I had written about him in the last year, just to make sure that I wasn’t oversaturating the site with too much Lamb content. Luckily, I’ve only written about him once in 2017, so I feel comfortable discussing what has been an absolutely remarkable last month for the Arizona Diamondbacks third sacker. The Arizona Diamondbacks are off to a hot start on the offensive side, ranking in the top five in Major League Baseball in batting average, isolated power, and, more obviously, runs, while ranking eighth overall in on-base percentage. Lamb’s quick start is a heavy reason why, as he’s not only managed to duplicate his extremely impressive start from last season, but eclipse his output in numerous ways. This May has been something of a microcosm of the type of player that Lamb has shown flashes of becoming over the past calendar year. Miguel Sano has been an absolute terror at the plate this season. Sure, there are flaws in his game and those may never go away. But the early results have been tremendous for a guy who seems to do nothing but crush every baseball that he comes into contact with. Sano has gotten off to a stellar start for a Minnesota Twins squad that doesn’t look all that bad. His slash features an average at an even .300, while he’s reaching base at a .431 clip. Obviously a .440 batting average on balls in play tends to aid you in those aspects, but when you’re hitting the ball as hard as he is, something we’ll touch on in a moment, that number is always going to remain high. It all culminates in a park-adjusted offense of 190, which ranks at the top of the third base group by 23 points. The approach hasn’t necessarily improved, but remained constant from last year into 2017. His Swing%, at 42.6%, is only 1.6% higher than it was last year. He’s seeing 4.24 pitches per plate appearance, a figure identical to that of 2016. His whiff rate is still higher than you’d like, at 14.3%, but it’s only 0.3% higher than last year. Brooks has him swinging at just about the same amount of each pitch type as he did last year. And with the minimal change in those figures, his contact rate has also remained almost identical across the two seasons. His 65.9% contact rate isn’t terrific and represents a 0.1% increase from the previous year. When you factor in the notable improvements in his health, it becomes far less surprising that he’s managed to graduate from a wRC+ of 107 to the 190 mark he’s posted thus far in 2017. When he’s run into balls, he’s doing some major damage to a point that no other hitter in baseball can really touch at this point. Despite a high strikeout rate (34.1%) and that high swinging strike percentage, Sano is making hard contact at an absurdly high rate. Nick Castellanos is the only player in baseball with a higher percentage of hard hit balls this year, as Sano currently sits at a 53.5% Hard%. He’s making soft contact at a rate of 1.7%. Read that again. That’s absolute nonsense. Baseball Savant has Sano averaging 98.9 MPH in terms of exit velocity. That’s easily the highest in all of baseball. When you combine that with his high launch angle tendencies, this guy has the potential to be a fantasy owner’s absolute dream over the course of a full season. In fact, Sano has already showcased a dip in his groundball numbers. His 29.3% GB rate represents a five percent decrease and ranks 176th among 183 qualifying Major League hitters. As such, his 28.6% HR/FB ratio ranks third at the position, trailing only Joey Gallo and Jake Lamb, which isn’t terribly surprising given the power tendencies of each individual in their own right. Especially Jake Lamb. Because we all know how I feel about Jake Lamb. That penchant for making obscenely hard contact, while constantly putting the ball in the air, is going to continue to benefit Sano greatly. Especially if he can maintain the respectable 22.4% linedrive rate that he’s posted to this point. There are obvious drawbacks to his game. He’s prone to strikeouts, which is nothing new at this point, and he is susceptible to whiffs low in the zone, particularly on the outer half of the plate. However, if he can continue to demonstrate improvements in his walk rate (18.7% BB rate is almost an eight percent increase from last year), he becomes that much more valuable. It’s hard not to fall in love immediately with a player like Miguel Sano. Players with obscene power are always a treat to watch and particularly intriguing on the fantasy side. The strikeouts are always going to be there and represent one of the larger drawbacks of his game. However, with the ability to make this kind of contact and the power that he possesses, a healthy Miguel Sano is going to be an absolute joy to continue to watch develop out of the hot corner moving forward. Where is Justin Turner’s Power Hiding? I was going to use the opportunity for my weekly content here to talk about Jake Lamb and his 481-foot home run, but I didn’t want to oversaturate the third base column with more Lamb material than I’ve already indulged myself in the past several months. Even if he is extremely noteworthy these days. Instead, let’s talk about one of his National League West counterparts: Justin Turner.